This story was updated at 8:27 p.m. ET. A huge, dead satellite tumbling to Earth is falling slower than expected, and may now plummet down somewhere over Canada, Africa or Australia late tonight or early Saturday, NASA officials now say. As of 7 p.m. EDT (2300 GMT) today, the UARS satellite was flying in an orbit of about 90 miles by 95 miles (145 kilometers by 150 km), and dropping. NASA launched the UARS satellite in 1991 to study Earth's ozone layer and upper atmosphere. 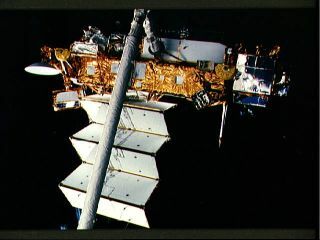 The satellite was decommissioned in 2005. Earlier today, officials reported that solar activity is no longer affecting the satellite's rate of descent. But exactly where the UARS spacecraft will fall still remains anyone's guess. NASA orbital debris experts have said the satellite could fall anywhere between the latitudes of Northern Canada and Southern South America, a region of Earth that encompasses much of the planet. NASA officials have said that, since 75 percent of the Earth is covered with water, it is likely that the UARS satellite could fall over an ocean.